The folk songs, music, dances etc. of an area reflects its traditional cultural richness. As the life of the people of this District is closely associated with nature and religion, the folk activities are closely associated with these features in representation of the inherent customs and traditions of the people. Folk songs of this region reflects a basic simplicity and uncomplicated emotions, largely derived from the environment of the peace, tranquility and the open nature all around. The themes of songs are understandably linked with various agricultural activities, their main stay and the great love for the land. Not unexpectedly, certain socio-economic problems figure in the songs like floods, droughts and ill treatment of the people. Some folk songs narrate stories of bravery and legends. The tradition of folk songs is much alive in the rural areas. In villages, women sing these folk songs while working in the fields or collecting fodder in forest. There are many styles of group singing, sometimes, accompanied by rhythmic dances. These include “Jhoda” and “Thadya”. “Khuded” songs echo the sad feeling of young bride pinning for their far-away paternal homes. “Mandals” songs recite on the occasion of marriage, thread ceremony and other “sanskars”. “Panwaras” songs are composed to record heroic deeds and sing in praise of worriers. Folk dances of the region are mainly for entertainment, recreation and praising the local Gods. Generally, these are performed in groups. Some dances are accompanied by folk songs and carry the same name. These folk dances are mainly influenced by the devotional attachment of the people with “Natraja”, the God Shiva, and the association of “Pandava” of Mahabharata to the Garhwal Himalaya. In religious folk dances, the dance of ‘Pashwa’, a person carrying local God’s spiritual traces, on the ‘Jagar’ songs are most common. ‘Jagari’ directs these dances and ‘Pashwa’ (the dancer) dances as per the ‘Varta’ (the story songs) of the particular God or Goddess. ‘Pandav’ dances are based on the story of ‘Pandava’ in Mahabharata and these are group dances played to the rhythm of ‘Dhol & Damoun’ in an open ground called ‘Mandaan’. The social group dances of the area represent the rich social traditions and joys of the life. The examples of such dances are ‘Thadiya’, ‘Chauffulla’, ‘Holi’, ‘Sarron’, ‘Chepli’ etc. 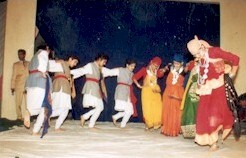 ‘Thadiya’ dance is generally played in fairs and festivals, in which the dancers are divided in two groups and dancers of the one group are tied with each other by keeping one’s hand on next one’s shoulder with dancing in a semi-circular arc. 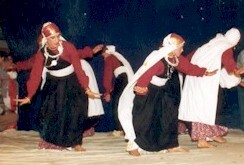 ‘Chauffulla’ dance has a distinguished place amongst the Garhwali dances. It represents the perfect union of Reality and Pleasure in human life. ‘Chauffulla’ means ‘blossoming of flowers all around’. In ‘Holi’ dances, the groups are visited from one village to another with dancing in front of each house of the villages. These dances are played by the groups in a circle with singing ‘Holi’ songs on rhythm of ‘Dholak’. ‘Sarron’ dances are placed during the occasion of marriage in which well-dressed dancers play the dances ahead of ‘barat’ (the marriage party) with its proceeding. In these dances, the elasticity and expertise of hand, leg and whole body movements are spectacular. The folk music of this area is generally rhythmic which is reflected in the dynamic style of folk dances. Songs related to ‘Sansakaras’ and seasons are melodious but the rest are musical as they are played on the rhythm of the musical instruments. The traditional folk musical instruments of this area are ‘Dhol & Damoun’, ‘Daur & Thali’, ‘Turri’, ‘Ransingha’, ‘Dholki’, ‘Masakbhaja’, ‘Bhankora’ etc. Nowadays, Harmonium and Tabla are also in use. The traditional instrumentalists ‘Auji’, ‘Badhi’, ‘Bajgi’ have made a great contribution in the folk music of this area. ‘Dhol & Damoun’ are played together by ‘Auji’. These are main folk musical instrument of the area and are played on most of the occasion. These are played on the basis of ‘Dhol-Sagar’, a ancient ‘granth’ of ‘Shankar Vedanth’ or ‘swar-sagar’ containing ‘Dhol’ rhythms for each occasion. “Daur & Thali” are played on the occasion of “Ghandiyala” with ‘jagar’ songs and dances. “Turri” and “Ransingha” are the instruments of war. These are made of brass or copper. “Bhankora” is played only by the upper caste on the occasion of “Dev-Poojan”. 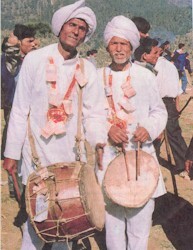 “Dholaki” is generally used by the traditional instrumentalist “Baghi” or “Dhaki”.